Maggie joined the team in the middle of 2017 and is a wonderful addition to Chapmans. Her job involves juggling a lot of balls in the air to offer the support the rest of the team requires daily to maintain the high standard of client care and service we pride ourselves on. 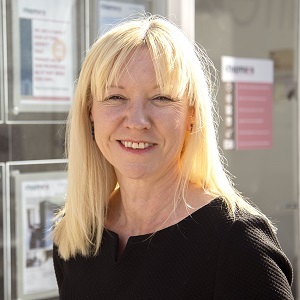 Maggie’s background is in Financial Services and Recruitment, so she has solid skills and experience in the world of Professional Services and more importantly, in customer services. Her husband runs his own plumbing and heating company, so this has only served to increase her understanding of the importance around effective and efficient communications. Friendly, reliable and honest, you can expect a warm welcome from Maggie as our main point of contact for the office and a cheery voice over the phone as she aims to provide a friendly and efficient service and help you in any way she can. Favourite Holiday – Barbados – a holiday of a lifetime! Favourite Food – Anything that’s cooked for me! !